SupHerb Spirulina Algae provides a high and unique dose of 600 mg Spirulina Algae per capsule. 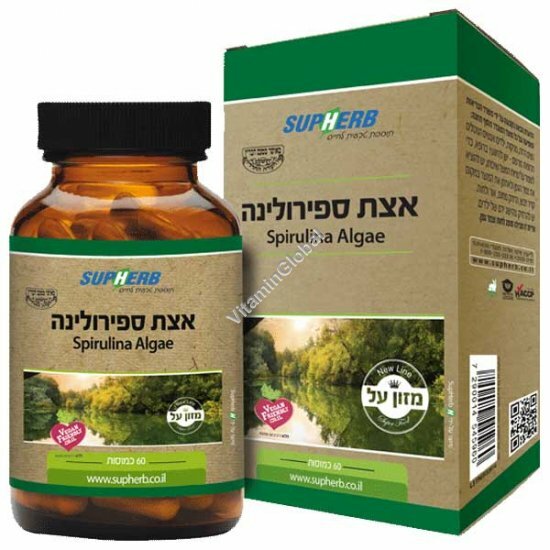 Spirulina algae has varied physiological effects and high nutritional importance as it contains a high concentration of nutritional components (nutrients) that are essential for normal body function and also serve a therapeutic purpose to treat and alleviate various diseases. Spirulina is microscopic algae that grow in warm climates and fresh water. Usage: 1-2 capsules a day with meals. Recommended in Combination with: Biotikid LR, Kosher L'Mehadrin Omega 3, Kosher L'Mehadrin B-50 Complex.